A good connection is essential for smartphones for stable voice calls and fast data transfers. Testlab measures over the air radio performance according to CTIA OTA Test Plan Revision 3 in a screened chamber with a TS9881 measurement system from Rohde & Schwarz. Please download the article if you want to know more of the capabilities of our OTA measurement system. Modern smartphones are an important part of everybody's life, yet they lack endurance all so often. As an industry metric to judge smartphones has been missing for so long, Testlab has developed its own set of measurements. To bring the measurements in agreement with typical battery life under normal usage scenarios a number of studies have been conducted about how people use their smartphones. The Testlabs battery life measurements have been based on these studies and are regularly refined. The display is the most important interface between the smartphone and its owner. Yet display quality is often lacking, especially under bright sunlight and viewed from the side. 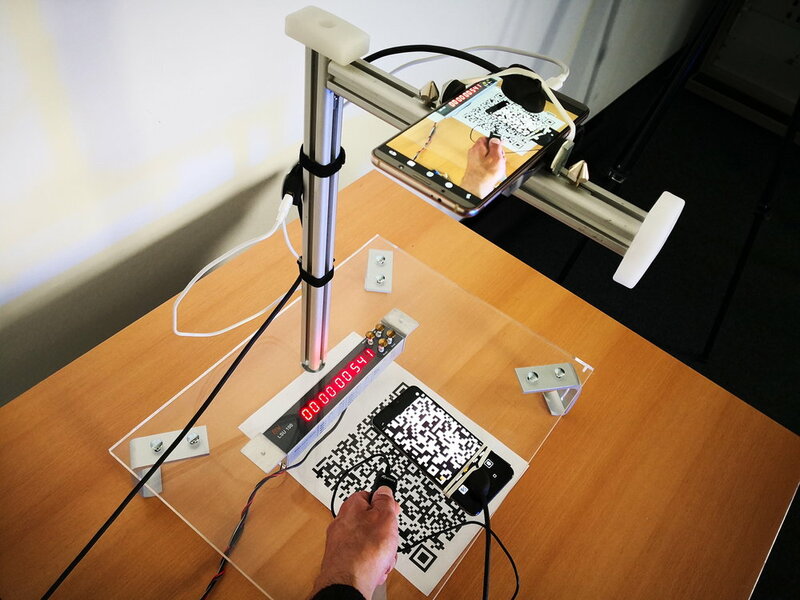 To measure angle or ambient light dependent contrast ratio, color fidelity, mirroring and other important KPIs, Teslab uses a more than 100 kilo weighting piece of optical precision from Autronic-Melchers called DMS-703. To learn more about Display measurements click the button below. There are a lot of benchmarks to measure the speed of smartphones. But most of them consider only singular aspects of performance like CPU speed, memory transfers or graphic speed. connect uses a more holistic approach to measure the reaction time of smartphones. This approach is usable on brand new devices, devices which have been in use for a while and devices which have been aged by a software developed in collaboration with Huawei. Despite streaming services and CD the turntable is still very popular among audiophiles. With equipment from Audio Precision, Brüel & Kjaer and others Testlab has the means to measure wow & flutter, rumble, low frequency resonance, frequency response, tracking ability and all kinds of distortions. Well preserved test records from B&K, JVC and DIN (Beuth), calibrated cartridges and a spring suspended 200 kilo platform ensure the highest precision in measurements. With a complete set of KPIs Testlab can discern professional quality from me-too products. You want to know, if your turntable, tonearm or cartridge is ready to conquer the market? Ask us. We are ready to supply the answer. Most amplifiers behave well in resistive loads. But real world loudspeakers often behave radically different. To take this into account, Testlab has developed its own and unique load with up to eight channels ranging from 1 to 8 Ohms and enabling phase shifts between -60 to +60 degrees in 20 degree increments for output power measurements. An amplifier working well under the strain of this load will behave well under any conditions. Of course Testlab can supply all kinds of measurements, like frequency response, distortion, S/N ratio for all kinds of electronics. And of course we can measure from 115 Volts/60 Hz an below to more than 230 Volt/50 Hz stabilised to a fraction of a Volt for up to 3200 Watts. Whenever the room is too small to accommodate a large loudspeaker, a headphone is a nice alternative for high quality sound reproduction. But it needs a high quality headphone to offer high fidelity performance. Testlab has set up a number of important measurements to judge frequency response, total harmonic, distortion, efficiency, and maximum sound pressure level. With these measurements based on equipment from Audio Precision, Brüel & Kjaer, Head Acoustics and others it is easy to review a headhone and evaluate its quality against the competition. It takes a large, specialized room, expensive equipment and experience as well as knowledge to measure loudpspeakers correctly. Testlab has invested in a semi anechoic room, excellent equipment from Audio Precision and Brüel & Kjaer with custom built and programmed extensions to measure loudspeakers in a three stage process. In this way frequency response, frequency and level dependent distortion, compression, maximum SPL and frequency dependent impedance are measured without the influence of a room. This set of measurements offers a neutral determination of position in a highly competitive market. And it may bring a few hints for upgrades, to give you a helpful advantage against a stiff competition.